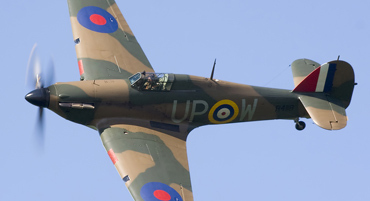 The arrival of any freshly-restored Hurricane on the display circuit is a welcome and rare occurrence – but the latest addition uniquely recreates the ground-attack version of Hawker’s famous fighter. TONY HARMSWORTH reports. AS MOMENTS OF quintessential Englishness go, this was going to take some bearing. A glorious August morning at the former Battle of Britain airfield at North Weald, and the hangar doors are rolled open to reveal a newly-restored Hawker Hurricane IIB, its broad-shouldered, four-square Churchillian countenance accentuated on this occasion by the 250lb bombs under each wing. 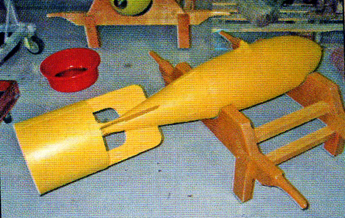 One of the two glassfibre replica 250lb bombs. Once the aircraft has been rolled outside, Peter’s engineer begins to remove the very convincing replica bombs – for, today, Peter will fly a display in the Hurricane for only the second time, at a corporate event at Bearstead down in the Weald of Kent, where Hurricanes gained immortality in the dark, decisive days of the Battle of Britain. After displaying the Hurricane, Peter will return to ‘Weald and strap into his Supermarine Spitfire PR.XI, to fly back for a second display. He is now the busiest civilian warbird pilot in Europe, flying 60 public flying displays last season in his Hangar 11 Collection fleet of Curtiss P-40 Kittyhawk, North American P-51D and photo reconnaissance Spitfire. Built in Canada in 1942 as CCF/R20023, it is one of 1,451 Hurricanes made under licence by Canadian Car & Foundry. Early examples were completed as Mk IIBs with wing attachment points for bomb racks or droptanks, while later ones were built as Mk XIIs. It served with the RCAF as a home-based fighter for the duration of the war. In 1946 it was refurbished to as-new condition and then disposed of as surplus, engine up on a Canadian farm. 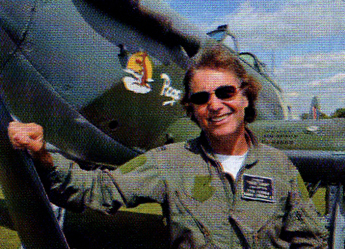 Tony Ditheridge bought the Hurricane from Bob Schneider in Hawkins, Texas, in 1989. The package included fuselage, engine mount, tailplane and wings. “During the restoration I went over to the HRL workshop every couple of weeks”, says Peter. “It was very important to get to know the aircraft from the ground up, and to understand the construction philosophy. It was great to feel part of it.” Retaining originality was also a key requirement. “Anything that could be reused went back on the aeroplane; other missing parts were replaced by original period items wherever possible, as in most cases new parts are just not available”. Above right : Sgt Jback “Banger” Yates and Sgt Brooks beside BE505 while it was at 607 Sqn at Manston, coded AF-L. 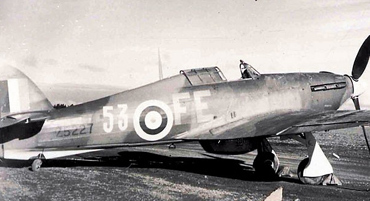 Both Yates and the Hurricane transferred to the newly formed 174 Sqn on March 21,1942. Above left : Jack’s grandson, Douglas Yates recreates the pose with Hangar 11’s Alec Kinane. Steve Atkin, an architect by day and a Hangar 11 volunteer in his spare time, researched the paint scheme and masterminded the replica bombs. “The bomb project was done by Hangar 11, in conjunction with Sywell Aviation Museum, who make the fins for us”, Steve says. “An original 250lb bomb was loaned by the RAF Museum, and moulded in glass fibre for us by a specialist company. 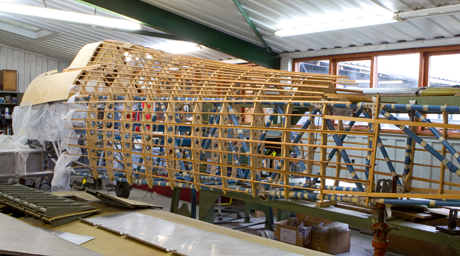 The partly restored Fuselage and Centre Section in March 2007. On the firewall is the coolant header tank. 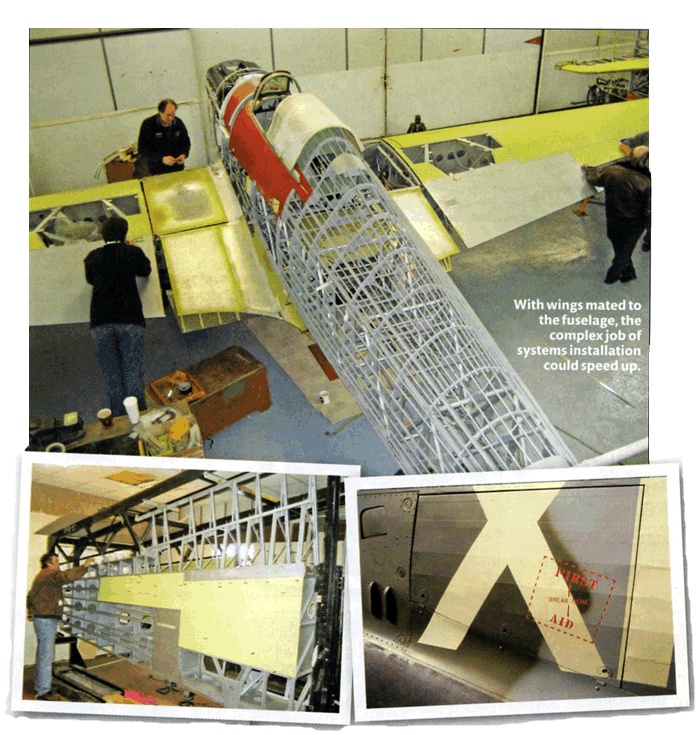 Hangar 11’s Chief Engineer Chris Norris examining the port wing as skinning gets under way in March 2008. Detailed stencilling on the fuselage. The metal fittings were made by Eyetech Engineering to our drawings. We worked closely with HRL to ‘reverse engineer’ some missing parts of the bomb carriers. A lot of work went into getting them on to the aircraft, as no other complete original units existed. 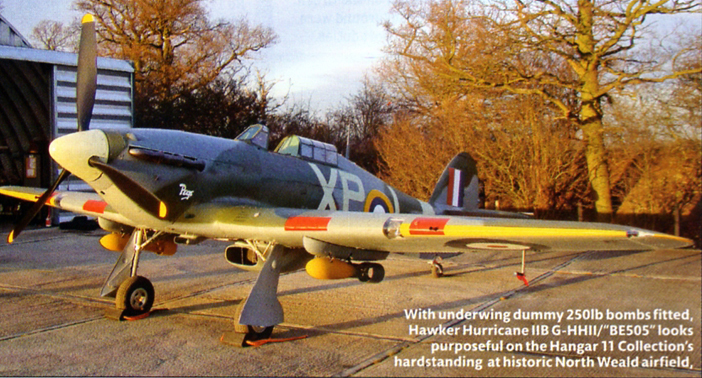 The job was complicated by the fact that the Hurricane fitment was heavily modified from the Air Ministry standard carriers. “The bombs were extraordinarily realistic, with all the surface blemishes of the original, and are filled with high-density foam for correct weight distribution. With the bomb carriers fitted one gun has to be omitted, as the fairing fouls the cartridge ejector chutes”. 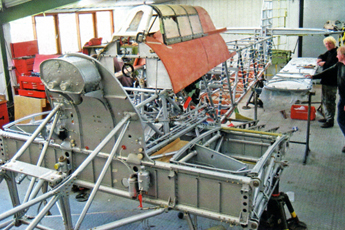 Above from left : the rear outer-wing attachment point on the centre section; a cluster joint between fuselage and centre section; the pneumatic-system air bottle which supplies the brakes and gun-cocking mechanism; the rebuilt Packard Merlin 29 engine arrives. Above from left : A bomb rack; the bomb-release switch panel in the lower right-hand ride of the cockpit; the starboard wing gun-bay, showing the 0.303in Browning machine guns and ammunition feeds; the unusual configuration of the two outer guns on the port wing. 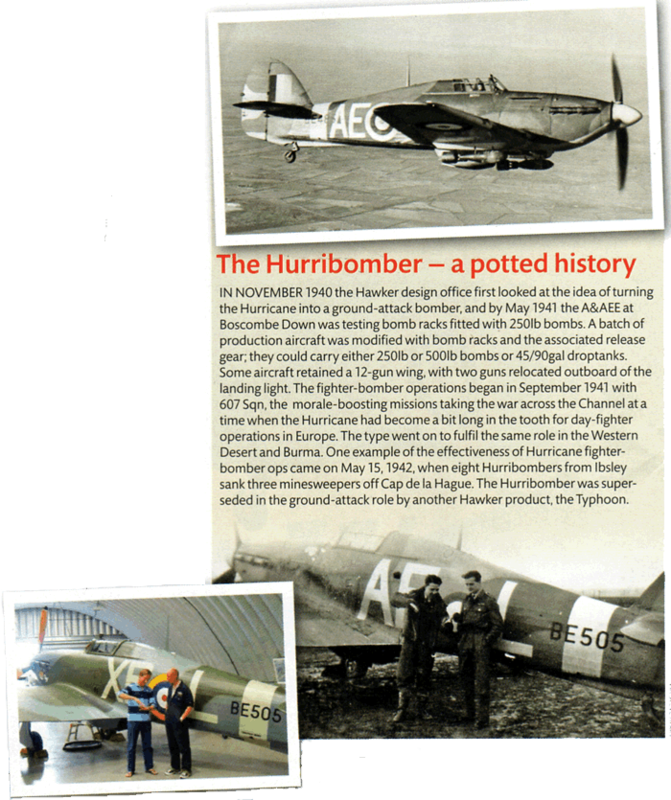 The Hurricane flew again after some 60 years in January 2009 with HRL test pilot Stuart Goldspink at the controls, and Peter got to fly it soon afterwards. And talking of grace, let’s return to the cricketing theme. 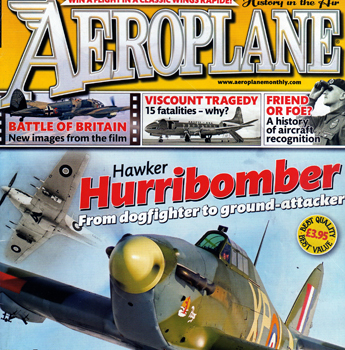 By the time this issue appears, the Hurribomber will almost certainly have made more public appearances than England’s middle-order batsmen mustered during the crushingly disappointing fourth rest, Watch out for this superb addition to the vintage scene as Peter bowls up in it.